The Moon is Earth's only natural satellite. Natural satellites of other planets are also called moons, although they usually have their own unique names. The symbol for the Moon is a crescent. The terms "lunar," "selene/seleno-," and "-cynthion" (from the lunar deities Selene and Cynthia) refer to the Moon. The average distance from the Moon to the Earth is 384,403 kilometers (238,857 miles). The Moon's diameter is 3,476 km (2,160 mi). Reflected sunlight from the Moon's surface reaches Earth in 1.3 seconds (at the speed of light). The first man made object to land on the Moon was Soviet Union's Luna 2 in 1959; the first photographs of the otherwise hidden "far side" of the Moon were made by Luna 3 in the same year; and the first people to land on the Moon got there aboard the United States' spacecraft Apollo 11 in 1969. The Moon is a close companion of Earth as they travel together through space. The spinning Earth's oceans, always bulging out toward the Moon, rise and fall along the coastlines, where millions of people and uncounted billions of living organisms pace their lives according to the tides. As the great light of the night tracing arcs across the sky, and with a visible shape changing through roughly 12 regular cycles per solar year, the Moon for millennia has inspired awe, careful study, poetic vision, and romantic passion. The correlation of Moon cycles with Sun cycles was noted by primitive peoples and inspired the development of several different lunar calendars. The Moon figures prominently also in most systems of astrology, and has been important to the advance of astronomy at least since Galileo Galilei's telescopic observations led him to conclude that the Moon's surface had hills and valleys. Evidence of ancient moon worship has been found from Asia to Europe, Africa, and South America. Traditional agricultural communities scheduled major events like planting and harvesting according to the phases and seasons of the moon. The close correlation of the length of the human menstrual cycle with the length of a lunar month has supported the persistent idea that the cycle of the moon influences or even controls human menstrual cycles, but the idea has not been corroborated with rigorous studies. Another evidence of presumed lunar influence is carried in the word lunacy with its implication (not verified) that mental illness is associated with the phases of the Moon. Striking and unexplained numerical recurrences related with the Moon are considered by some to be evidence of design in the Universe, while others consider them to be no more than interesting coincidences. The precise size correlation of the Moon and Sun in the sky as revealed by a total solar eclipse offers further cause to wonder about a possible supernatural order behind it all. 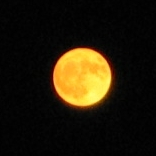 Yellow moon observed over Hockessin, Delaware. The Moon has been the subject of many works of art and literature and the inspiration for countless people of all races. The Moon is a motif in the visual arts, the performing arts, poetry, prose, and music. Upon observing the patterns of lighter and darker areas on the Moon, people of different cultures have visualized images of the Man in the Moon, the rabbit, the buffalo, and so forth. A 5,000-year-old rock carving at Knowth, Ireland, may be the earliest known depiction of the Moon. In many ancient cultures, the Moon was thought to be a deity or other supernatural phenomenon, and the influence of the Moon on human affairs has been a continuing theme in astrology. In the Western world, one of the first thinkers to offer a material explanation for the Moon was the Greek philosopher Anaxagoras. He thought that the Sun and Moon were both giant spherical rocks, and that the latter reflected the light of the former. His materialistic view of the heavens was one cause for his imprisonment and eventual exile. Tycho crater on the Moon is about 85 kilometers across. By the Middle Ages, before the telescope was invented, more people began to recognize the Moon as a sphere, though they believed it was "perfectly smooth." In 1609, Galileo Galilei drew one of the first telescopic drawings of the Moon in his book, Sidereus Nuncius, and noted that it was not smooth but had craters. It is now known that mountain chains as well as craters are prominent lunar features. Later, in the seventeenth century, Giovanni Battista Riccioli and Francesco Maria Grimaldi drew a map of the Moon and gave many craters the names scientists still use today. On maps, the dark parts of the Moon's surface were called maria (singular mare) or "seas," and the light parts were called terrae or "continents." The possibility that the Moon could contain vegetation and be inhabited by "selenites" was seriously considered by some major astronomers even into the first decades of the nineteenth century. In 1835, the Great Moon Hoax fooled some people into thinking that exotic animals lived on the Moon. At about the same time (1834–1837), however, Wilhelm Beer and Johann Heinrich Mädler were publishing their four-volume Mappa Selenographica and the book, Der Mond, which firmly concluded that the Moon has no bodies of water nor any appreciable atmosphere. There remained some controversy over whether features on the Moon could undergo changes. 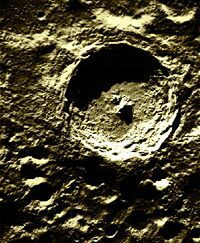 Some observers claimed that some small craters had appeared or disappeared. In the twentieth century, it was determined that these claims were illusory, based on observations under different lighting conditions or the inadequacy of earlier drawings. It is, however, recognized that the phenomenon of "outgassing" (slow release of trapped gases) occurs occasionally. 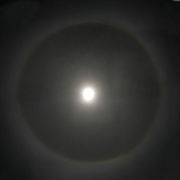 Coronal ring around the Moon through thin clouds. During the brightest full moons, the Moon can have an apparent magnitude of about −12.6. By comparison, the Sun has an apparent magnitude of −26.8. When the Moon is in its quarter phase, its brightness is only about one-tenth of that of the full Moon because the amount of solar radiation reflected toward the Earth is highly reduced due to the shadows projected by the higher parts of the Moon over the lower ones. The Moon appears larger when close to the horizon. This is an optical illusion. In fact, the angular diameter of the Moon when viewed from straight overhead on the Earth is about one half of one degree, but when viewed near the horizon the Moon's image is about 1.5 percent smaller the Moon is farther away by nearly one Earth radius. Another quirk of the visual system causes observers to see the Moon as almost pure white, when in fact it reflects only about 7 percent of the light falling on it—about the same as the reflectivity of a lump of coal. It is said to have very low albedo (reflectivity). The Moon's brightness can be attributed at least partly to the extreme brightness of the Sun. Another reason is that there is nothing next to the Moon to reflect sunlight, therefore it is perceived as the brightest object visible. From any location on Earth, the highest altitude of the Moon on a given day varies in the same way as the Sun's highest altitude, dependent on the season and the lunar phase. For example, in the winter, the Moon is highest in the sky when it is full, and the full Moon is highest in winter. The orientation of the Moon's crescent side also depends on the latitude of the observing site. Close to the equator, an observer can see a "boat" Moon. Like the Sun, the Moon can give rise to atmospheric effects, including a 22 degree halo ring and smaller coronal rings seen more often through thin clouds. The Moon keeps the same face turned toward the Earth at all times. This is because the Moon takes as long to rotate about its axis as it does to orbit the Earth—a phenomenon known as "synchronous rotation." The side of the Moon facing Earth is called the near side; the opposite side is called the far side. The far side is also sometimes called the "dark side," referring to "unknown and hidden," not "lacking light." In fact, the far side receives (on average) as much sunlight as the near side, but at opposite times. When spacecraft are on the Moon's far side, the Moon blocks direct radio communication with Earth. One distinguishing feature of the far side is its almost complete lack of maria. 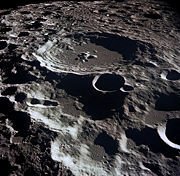 The far side of the Moon remained completely unknown until it was observed by the Luna 3 probe launched in 1959, and mapped extensively by the Lunar Orbiter program in the 1960s. The Moon's synchronous rotation is true only in an average, overall sense, because the Moon's orbit has definite eccentricity. When the Moon is at its perigee (point in its orbit closest to Earth), its rotation is slower than its orbital motion, allowing observers to see up to an extra eight degrees of longitude of its East (right) side. Conversely, when the Moon reaches its apogee (point in its orbit farthest from Earth), its rotation is faster than its orbital motion and reveals another eight degrees of longitude of its West (left) side. This phenomenon is called longitudinal libration. Recently, the Giant Impact hypothesis has been considered the most plausible scientific hypothesis for the Moon's origin, when compared with other hypotheses such as coformation and condensation. The Giant Impact hypothesis holds that the Moon was formed from the ejecta of a collision between a very early, semi-molten Earth and a planet-like object the size of Mars. The material ejected from this impact is thought to have gathered in orbit around Earth and formed the Moon. This hypothesis is bolstered by two main observations: First, the Moon's composition resembles that of the Earth's crust, and it has relatively few heavy elements that would have been present had it formed by itself out of the same material as the Earth. Second, radiometric dating indicates that the Moon's crust formed between 20 and 30 million years after that of Earth, despite its smallness and associated larger loss of internal heat. In addition, the hypothesis is supported by the observation that the Moon and Earth have the same oxygen isotopic abundance trend, confirmed with samples brought by Apollo 11. Some, however, have noted that this hypothesis does not adequately address the abundance of volatile elements in the Moon. It is thought that the Moon, during its early stages, was a molten sphere and was much closer to the Earth. Strong tidal forces deformed the sphere into an ellipsoid, with the major axis pointed toward Earth. When the Moon started to cool, a solid crust formed along its surface, but its molten interior remained displaced in the direction of the Earth. In other words, the Moon's crust on the near side was much thinner than that on the far side. During a period known as the "late heavy bombardment," around 3.8 to 4 billion years ago, many large meteorites were able to penetrate the thin crust of the near side but few could do so on the far side. Where the crust was perforated, hot lavas oozed out of the interior and spread over the surface, cooling down later to form the maria observable today. This scenario explains the paucity of maria on the far side. The geological epochs of the Moon are defined based on the dating of various significant impact events in the Moon's history. 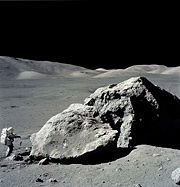 The period of the late heavy bombardment is determined by the analysis of craters and Moon rocks. In 2005, a team of scientists from Germany, the United Kingdom, and Switzerland measured the Moon's age at 4,527 ± 10 million years, which would imply that it was formed only 30 to 50 million years after the origin of the solar system. 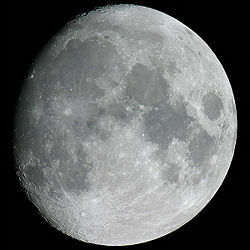 The Moon's overall composition is believed to be similar to that of the upper parts of the Earth, other than depletion of volatile elements and iron. Observations by the technique of spectroscopy indicate that the current lunar crust is composed of various primary elements, including uranium, thorium, potassium, oxygen, silicon, magnesium, iron, titanium, calcium, aluminum, and hydrogen. Some spacecraft—such as the Galileo probe, Clementine, and Lunar Prospector—have mapped the abundance of these elements over parts of the Moon, but complete mapping of these elements over the entire lunar surface has not been performed. Scientists think that more than 4.5 billion years ago, the Moon's surface was an ocean of molten rock, or magma. One component of lunar rocks, called KREEP (potassium (K), rare earth elements (REE), and phosphorus (P)), is thought to represent the last chemical remnant of that magma ocean. KREEP is a composite of what researchers call "incompatible elements"—those that do not fit into a crystal structure and were left behind, floating to the surface of the magma. KREEP is a convenient tracer, useful for understanding the lunar crust's volcanic history and chronicling the frequency of impacts by comets and other celestial bodies. When observed with Earth-based telescopes, the Moon can be seen to have some 30,000 craters, with a diameter of at least 1 km, but close-up observations from lunar orbit reveal a multitude of smaller craters. Most are hundreds of millions or billions of years old. The weather, lack of atmosphere, and recent geological processes ensure that most of them remain permanently preserved. There are places on the Moon where it is impossible to add a crater of any size without obliterating another—a condition called "saturation." The largest crater on the Moon, and indeed the largest known crater in the solar system, forms the South Pole-Aitken basin. This crater is located on the far side, near the lunar South Pole. It is some 2,240 km in diameter and 13 km in depth. The dark and relatively featureless lunar plains, called maria, are vast, ancient basaltic lava flows that filled the basins of large impact craters. The lighter colored terrae correspond to highlands. Blanketed atop the Moon's crust is a layer of loose, dusty material called regolith, the result of rocks shattered by billions of years of impacts. Both the crust and regolith are unevenly distributed over the entire Moon. The crust ranges from 60 km (38 mi) on the near side to 100 km (63 mi) on the far side. The regolith varies from 3 to 5 meters (10 to 16 ft) in the maria to 10 to 20m (33 to 66 ft) in the highlands. In 2004, a team led by Dr. Ben Bussey of Johns Hopkins University, using images taken by the Clementine mission, determined that four mountainous regions on the rim of the 73 km wide Peary crater at the Moon's North Pole appeared to remain illuminated for the entire lunar day. The lighting of these unnamed "mountains of eternal light" is possible because of the Moon's extremely small axial tilt, which also leads to permanent shadows at the bottoms of many polar craters. No similar regions of eternal light exist at the less mountainous South Pole, although the rim of Shackleton crater is illuminated for 80 percent of the lunar day. Clementine's images were taken during the northern lunar hemisphere's summer season, and it remains unknown whether these four mountains are shaded at any point during their local winter season. When the lunar impact events were dated by 40Ar/39Ar isotope analysis of glass spherules created during the impacts, researchers found a high impact number in early lunar history and in the last 400 million years. Comets and meteoroids regularly bombard the Moon. Many of these objects are water-rich. Energy from sunlight splits much of this water into its constituent elements, hydrogen and oxygen, both of which usually fly off into space immediately. Some scientists, however, have hypothesized that significant traces of water remain on the Moon, either on the surface or embedded within the crust. The results of the Clementine mission suggested that small, frozen pockets of water ice (remnants of water-rich comet impacts) may be embedded unmelted in the permanently shadowed regions of the lunar crust. Although the pockets are thought to be small, the overall amount of water seemed to be quite significant—1 km³. Some water molecules, however, may have hopped along the surface and become trapped in craters at the lunar poles. As noted above, some of these deep craters never receive light from the Sun—they are permanently shadowed. Clementine has mapped craters at the lunar South Pole that are shadowed in this way. It is in such craters that scientists expect to find frozen water, if it is there at all. If found, the ice could be mined and split into hydrogen and oxygen, using solar-panel-equipped electric power stations or a nuclear generator. The presence of usable quantities of water on the Moon would be an important factor in rendering lunar habitation cost-effective, because transporting water (or hydrogen and oxygen) from Earth is prohibitively expensive. The equatorial Moon rock collected by Apollo astronauts contained no traces of water. Neither the Lunar Prospector nor more recent surveys, such as those of the Smithsonian Institution, have found direct evidence of lunar water, ice, or water vapor. The Moon has a magnetic field that is very weak compared to that of Earth. Some of the Moon's magnetism is thought to be intrinsic, such as from a strip of the lunar crust called the Rima Sirsalis. It is, however, possible that collision with other celestial bodies might have imparted some of the Moon's magnetic properties. Indeed, a long-standing question in planetary science is whether an airless body in the solar system, such as the Moon, can obtain magnetism from impacts with comets and asteroids. Magnetic measurements can also supply information about the size and electrical conductivity of the lunar core—evidence that will help scientists better understand the Moon's origins. For instance, if the core contains more magnetic elements (such as iron) than Earth, then the impact theory would lose some credibility (although there are alternate explanations for why the lunar core might contain less iron). The Moon has a relatively insignificant and tenuous atmosphere. One source of this atmosphere is "outgassing"—the release of gases such as radon, which originate deep within the Moon's interior. Another important source of gases is the solar wind, which is briefly captured by the Moon's gravity. Lunar samples returned by Apollo and Luna missions gave scientists the first evidence of space weathering, which is a common phenomenon on most airless bodies in the solar system. Space weathering makes the planetary surface darker and optically redder, making remote compositional analysis difficult. Recent studies and exploration of S-type asteroids have been revealing the possible mechanisms of space weathering. The Moon as seen from Earth. The sidereal month: The time it takes to make a complete orbit with respect to the stars, about 27.3 days. The synodic month: The time it takes to reach the same phase, about 29.5 days. These values differ because in the meantime the Earth and Moon have both orbited some distance around the Sun. Scientists use the Moon to visualize Earth's trajectory. When in its third quarter, the Moon is moving in its orbit in front of the Earth. As the distance from the Earth to the Moon is about 384,404 km and the Earth's orbital speed is about 107,000 km/h, the Moon is at a point where the Earth will be about three and a half hours later. Likewise, when the Moon is in its first quarter, it is where the earth was about three and a half hours earlier. The sidereal month of 27.32 days coincides with the freezing point of water at 273.2° K (273.2° above absolute zero). The relationship between the Moon and water is manifest in the Moon's control over the tides and month's correlation with the feminine cycle of ovulation and menstruation. The diameter of the Moon measures 0.273 Earth diameters. The acceleration of the Moon in its path around the Earth is 0.273 cm/s². The number 27.32 is directly related to the value of π. When a circle of radius 1 is inscribed inside a square, the ratio of the area of the square outside the circle (4-π) to the area of the circle (π) is (4-π)/π = 0.2732. The Earth-Moon system thus displays a fundamental constant of geometry. The duration of the Moon's orbit around the earth corresponds to the Earth's orbit around the Sun as a reciprocal. Thus 1/27.23 = 0.03660, and 1/366 = 0.002732. 366 days, of course, is the length of a leap year. Finally, the mass of the Moon is 1/81 times the mass of the Earth. The reciprocal of 81, 0.0123456790123... expresses the sequence of natural numbers 0, 1, 2, 3, 4, 5, 6, 7, 8, 9, 10, 11... allotting only one digit per number (this requires adjustments, as the 10 that follows 9 forces this 9 to become a 10, which writes as 0 in the allotted space and forces the 8 before it into a 9). The reciprocal of 81 thus represents all the numbers in the universe from 0 to infinity; furthermore the universe is constructed from precisely 81 stable elements. Much more can be said about 81, as 3 to the power of 4, two fundamental numbers that appear in the quantum structure of atoms, the genetic code, and in the dimensions of space and time. Are these completely unexpected results mere coincidence? For scientists who reject refuge in coincidence, they can be reckoned as a local example of the anthropic principle. Or do they hint at the Creator's design of the Sun-Earth-Moon system, the home to human beings, as manifesting universal principles by its precise celestial dimensions? Eclipses have throughout the ages filled people with wonder. They happen only when the Sun, Earth, and Moon are lined up. Solar eclipses can occur only around the time of a new moon; lunar eclipses can occur only near a full moon. The distance, size and path of the three heavenly bodies are arranged ingeniously from an astronomical point of view such that the Sun, which is much larger, takes up the same space when viewed from earth as the Moon. That is why during a total eclipse of the Sun the Moon almost exactly covers the Sun's disk. This is another remarkable coincidence, one to which early astronomers gave much thought. For those who believe this to be an expression of the Creator's design, it is deeply appropriate that people have looked upon total eclipses with religious awe. There is, however, some variation between the angular diameters of the Moon and Sun as seen from Earth, so that some solar eclipses are annular eclipses where the outermost part of the sun's disk shines in a ring around the moon. In a total eclipse, the Moon completely covers the disc of the Sun, and the solar corona becomes visible to the unaided eye. Since the distance between the Moon and Earth is increasing very slightly over time, the angular diameter of the Moon is decreasing. This means that hundreds of millions of years ago, the Moon could always completely cover the Sun during solar eclipses, and no annular eclipses were possible. Likewise, about 600 million years from now, the Moon will no longer cover the Sun completely, allowing annular eclipses but not total eclipses. Nevertheless, in keeping with the anthropic principle, it is noteworthy that we human beings live at the right time, when we can enjoy total eclipses of the sun. Astronomers have used the time of a solar eclipse to measure the deviation of light from a star when the light passes very close to the Sun. Their observations have confirmed the validity of Albert Einstein's theory of General Relativity. The Moon blocks the view of the sky directly behind it. The amount of blockage covers a circular area about 1/2 degree wide. When a bright star or planet "passes behind" the Moon, it is "occulted," or hidden from view. A solar eclipse is an occultation of the Sun. Given that the Moon is relatively close to Earth, occultations of stars are not visible everywhere. In addition, because of the moving nodes of the lunar orbit, different stars are occulted each year. The gravitational attraction that the Moon exerts on Earth is the cause of tides in the sea. The tidal flow period (but not the phase) is synchronized with the Moon's orbit around Earth. The tidal bulges on Earth, caused by the Moon's gravity, are carried ahead of the apparent position of the Moon by the Earth's rotation, in part because of the friction of the water as it slides over the ocean bottom and into or out of bays and estuaries. As a result, some of the Earth's rotational momentum is gradually being transferred to the Moon's orbital momentum, resulting in the Moon slowly receding from Earth at the rate of approximately 38 millimeters mm per year. At the same time, the Earth's rotation is gradually slowing—the Earth's day is lengthening by about 15 microseconds every year. In 1969, a concentration of meteorites was found on Antarctica by a Japanese exploration team. Since then, tens of thousands of meteorites have been found, among which those from the Moon have been identified. Together with samples brought back by the Apollo and Luna missions to the Moon, these lunar meteorites have been helping scientists study the origin and evolution of the Moon. The space race between the United States and the former Soviet Union, during the Cold War, accelerated exploration of the Moon. In the United States (and the West in general), the landing of the first humans on the Moon in 1969 is seen as the culmination of the space race. The first man to walk on the lunar surface was Neil Armstrong, commander of the American mission Apollo 11. He first set foot on the Moon at 02:56 UTC on July 21, 1969. The last man (as of 2006) to stand on the Moon was Eugene Cernan. As part of the Apollo 17 mission, he walked on the Moon in December 1972. On the other hand, many scientifically important steps—such as the first photographs of the far side of the Moon in 1959—were first achieved by the Soviet Union. Lunar samples have been brought back to Earth by three Luna missions 16, 20, and 24, and Apollo missions 11 through 17 (except Apollo 13, which aborted its planned lunar landing). 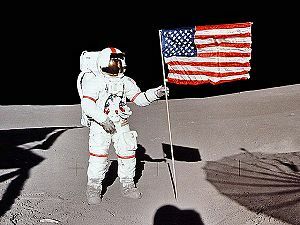 Astronaut Alan Shepard raises the flag of the United States on the Moon's surface. During the Apollo missions, a number of scientific instruments were installed on the Moon, including seismic detectors and reflecting prisms for laser ranging. Some of those instruments continue to function today. From the mid-1960s to the mid-1970s, there were 65 Moon landings (with 10 in 1971 alone), but they were discontinued after Luna 24 in 1976. The Soviet Union started focusing on Venus and space stations; the United States turned its focus towards Mars and beyond. In 1990, Japan sent the Hiten spacecraft to the Moon. The spacecraft released the Hagormo probe into lunar orbit, but the transmitter failed, rendering the mission scientifically useless. Regardless of that failure, Japan became the third country to place a probe in orbit around the Moon. In 1994, the United States finally returned to the Moon, in terms of sending the unmanned spacecraft Clementine. It was a Joint Defense Department/NASA mission that completed the first global multispectral data set for the Moon. This was followed by the Lunar Prospector mission in 1998, the third mission in the Discovery Program. The neutron spectrometer on Lunar Prospector confirmed the presence of excess hydrogen at the lunar poles. Some have interpreted this observation as indicating the presence of water. The European spacecraft Smart-1 was launched on September 27, 2003, and entered lunar orbit on November 15, 2004. Its mission ended with a controlled crash on September 3, 2006. The European Space Agency has plans to launch additional probes to explore the Moon in the near future. On January 14, 2004, U.S. President George W. Bush called for a plan to return manned missions to the Moon by 2020. In addition, the People's Republic of China has expressed ambitious plans for exploring the Moon and has started the Chang'e program for lunar exploration. Japan launched the Selene mission in 2007, and the Japanese Space Agency (JAXA) is planning a manned lunar base. India intends to launch an unmanned mission, Chandrayaan-1, in 2008. It will carry the Moon Mineralogy Mapper (M3), a U.S. instrument. Although several flags of the United States and the former Soviet Union have been symbolically planted on the moon, the Russian and U.S. governments make no claims to any part of the Moon's surface. Russia and the United States are party to the Outer Space Treaty, which places the Moon under the same jurisdiction as international waters. This treaty also restricts use of the Moon to peaceful purposes, explicitly banning weapons of mass destruction (including nuclear weapons) and military installations of any kind. A second treaty, the Moon Treaty, was proposed to restrict exploitation of the Moon's resources by any single nation, but it has not been signed by any of the space-faring nations. Also, several individuals have made claims to the Moon in whole or in part, though none of these claims are generally considered credible. ↑ Curious About Astronomy? Is the Moon seen as a crescent (and not a "boat") all over the world?Cornel university. Retrieved May 24, 2007. ↑ J. H. Jones, Tests of the giant impact hypothesis.Lunar and Planetary Institute. Retrieved May 24, 2007. ↑ Thorstein Kleine, K. H. Merzger Palme, and A. N. Halliday. 2005. Hf-W Chronometry of Lunar Metals and the Age and Early Differentiation of the Moon. Science 310, 1671-1674. Originally published in Science Express on November 24, 2005 Retrieved September 5, 2008. ↑ Lunar and Planetary Institute. Clementine Images on the Moon. Retrieved May 24, 2007. ↑ David H. Levy, Dr. Tony Phillips, "Science" NASA. Moon Water. Retrieved May 24, 2007. The Apollo Lunar Surface Journal (NASA) — Definitive history of Apollo lunar exploration program. Assembled Panoramas from the Apollo Missions. Digital Lunar Orbiter Photographic Atlas of the Moon. The Moon – by Rosanna and Calvin Hamilton. Inconstant Moon – by Kevin Clarke. 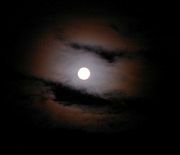 Full Moon Names and Their Meanings. The Moon Society (non-profit educational site). Why does the Moon appear bigger near the horizon? (from The Straight Dope). The Lunar Navigator: Interactive Maps Of The Moon features free, interactive online access to maps of the Moon's surface. 3D maps of Moon in NASA World Wind. Google Moon A view of the moon, including a reference to the myth that the moon is made of cheese. 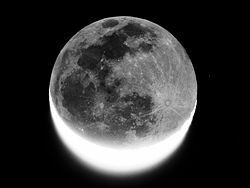 The Two Sides of the Moon An ABC Science online feature: Geoscientific debate about the origins of the Moon. Corkscrew Asteroids (PhysOrg.com), Asteroid 2003 YN107 as Earth's "second moon." Space.com: All About the Moon Moon Reference and News. This page was last modified on 19 October 2018, at 16:06.